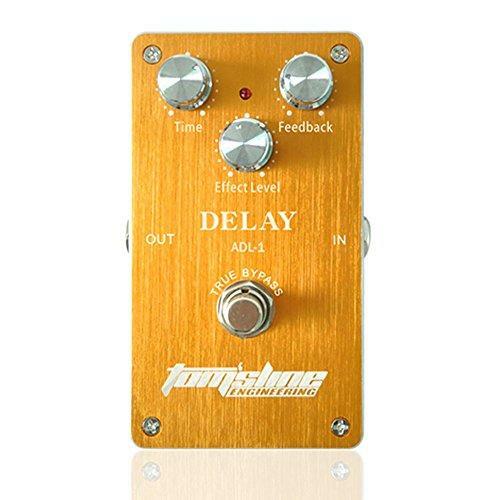 The Delay Pedal from Tom's Tone packs a lot of effect into a sturdy compact and truly affordable piece of kit. Always popular the Delay Effects Pedal records your input signal to an audio storage medium; the signal can then be played back multiple times to create the sound of a repeating decaying echo. Allows wide range of delay time from 50ms to 400ms. True bypass design, minimize tone loss and get more control of your pedal. Aluminum alloy housing, sturdy and durable. Vintage delay effects allow for the vintage tones of the 50's recording harmonica artists, noticeably by our main man, Little Walter who used his delay pedal into an old valve guitar amplifier using a Monarch MC-24 crystal pencil mic. A really heavy duty piece of kit, much more robust than anything in it's price range. Hook up your harp mic through this delay pedal and into your harmonica amplifier and play that blues harp music with the vintage Chicago tone you been searchin' for.